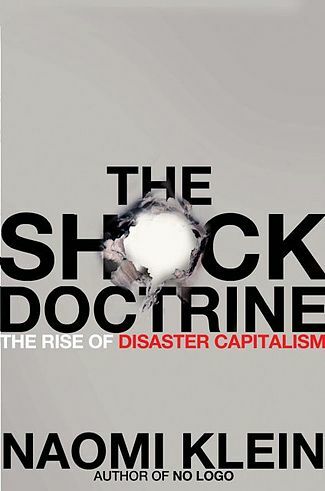 The cover of Naomi Klein's best-seller The Shock Doctrine. The book is available here. Click the link above for more information (or read the book), but in essence the idea is to use any form of disaster, whether earthquake or economic/political crisis, to remake a society in the neoliberal image. To reconstruct the destroyed world, in other words, to the liking of holders of great wealth — by privatizing everything of value held by the public (think water rights, public roads); by forcing austerity on cash-strapped governments as the price for "aid" (think loans, not grants, repaid by unwritten social insurance checks); by putting "managers," or simply loan officers, in charge of democratic decision-making. In simple, a "shock doctrine" solution always takes this form: "Yes, we'll help you, but we now own your farm and what it produces. Also, your family must work on it for the next 50 years." This is what happened in Chile after Pinochet and his coup murdered the democratically elected socialist Salvador Allende and took over the government. It's what's happening to Greece, victim of collusion between greedy international bankers and the corrupt Greek politicians they cultivated. And it's what happened in the U.S. during the 2008 bailout of bankers, by which government money was sent in buckets to companies like AIG so they could pay their debts in full to companies like Goldman Sachs. While millions of mortgaged homeowners crashed and burned to the ground. The populist reaction to neoliberal "reform" is usually social revolt, often or usually ineffective, since creditors are, almost by definition, people with money, and people with money, almost by definition, control most governments. In Greece, the revolt sparked the election of an (ineffective) "socialist" government — plus the rise of the Greek neo-Nazi party, Golden Dawn. In the U.S. the revolt still still sparks universal (and ineffective) hatred of the 2008 bank bailout — plus the rise of the failed Sanders candidacy and the successful Trump presidency. The "shock doctrine" — the stripping of wealth from the devastated by the already-way-too-wealthy — is now being applied to Puerto Rico. Even before the hurricanes hit it, Puerto Rico was a second-class citizen relative to states of the U.S., even among its non-state territories. In contrast to Puerto Rico, for example, the American Virgin Islands were instantly much better treated when it came to relief from the Jones Act, a sign of already-established prejudice. Thus, to most Americans the citizens of Puerto Rico are conveniently (for neoliberals) easy to paint as "them," the undeserving, which changes what atrocities can be committed in the name of "aid" — much like it did after Hurricane Katrina devastated "them"-inhabited New Orleans. In Puerto Rico's case, they entered the recent hurricane season burdened with load of debt, much (or most) of it bought on the secondary market and held by the hedge funds and the vulture banks you might expect to hold it. I haven't been able to find specific documentation on this, but I strongly suspect that much (or most) of this debt was purchased for pennies on the dollar by "investors" hoping to make the U.S. government make sure Puerto Rico never defaults on it, thus guaranteeing profit to the tune of many multiples of the original purchase price, profit of many hundreds of percent. That plan — forcing the U.S. government to force Puerto Rico to make every "investor" whole — was already in effect under the Obama administration, and it's in effect today. Classic bipartisan neoliberals in action. Then came hurricane season, with the kind of apocalyptic, lingering devastation you've most likely already heard about. Before the storms hit the island, Puerto Rico needed debt relief. Now they need humanitarian relief as well. They need not only to rebuild their economy, they need to rebuild the entire island itself. 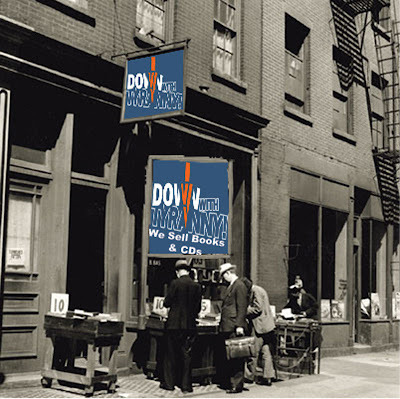 Debt "Relief" or Debt Forgiveness? What's killing the modern world, as I've noted for years and years, is the world-wide overhang of personal debt — not government deficits, which are entirely different, but the mortgage, credit card, payday and student debt that makes it impossible for too many households to return to their pre-2008 "normal," as constrained as even that that likely was. Put simply, if U.S. government policy is to "make every lender whole" before anything else is done, the mass of the U.S. population will see no recovery in their lifetimes. No economy in the world can grow at more than a snail's pace if every dollar earned is taken to pay unpayable debts — which is were we are today despite the illusory signs of "recovery" in many of our cities. Remember, debts that cannot be repaid won't be repaid., despite the best effort of creditors to squeeze debtors even to the grave. All that can happen is an escalation of social cruelty. In cases like these, when governments become the creditors' enforcement mechanism, revolts are bound to follow. In Puerto Rico, the problem is even worse than on the mainland. The "bankers" — a term I'll use to mean "holders of Puerto Rican debt" — are demanding that Puerto Rico pay them even before it pays its pension obligations, the equivalent of its Social Security checks. And now, in response to hurricane devastation, those same "bankers" are inducing the U.S. government to offer hurricane "relief" in the form of even more loans. Put simply, to get out of hurricane trouble, they must make their debt trouble worse or live with the status quo. Which brings us to the real point of Yeampierre and Klein's article: Not only is an anti-neoliberal recovery plan possible, but it's starting to happen. The writers offer two data points — about power generation and agriculture — but there are other areas of restructuring that could have been brought up as well. Renewable power sources are the inverse of carbon-based sources — they're climate-friendly, not climate-destructive. The "bankers" and others in the world of the wealthy are heavily invested in a carbon bubble they are desperate to get out of before it collapses. Much of the money world's money is tied to unburnable in-the-ground carbon, and they need to sell as much as they can before the bubble collapses — preferably after most of them are dead or otherwise financially secure. The obvious fight in Puerto Rico is the fight to create more seaside golf courses and five-star resorts ("wealth creation") as part of the price for "recovery." But there's so much more to this story. What we're about to witness in Puerto Rico is an island-wide pitched battle for and against broad-stroke neoliberal solutions to the island's combined and massive debt and hurricane crises. As you watch the battle unfold, watch through this wider lens, not just the lens of loans-for-aid and seaside resorts. If the Puerto Rican residents hold firm, as the writers seem to think they might, this could get very ugly fast, but it's a battle that must be joined everywhere. The Puerto Ricans may not go down easily; and they may even win. Good for them if they do; they deserve all of our help for just that effort alone. "In the U.S., we're living with the consequences of that revolt today, in the form of the current presidency. (Imagine the state of that revolt if Sanders had been available, and elected instead. Imagine government as the friend, not the enemy, of the long-suffering debtor class.)" Imagine the state of the "revolt" WHEN it elected obamanation to affect many of these changes -- remember that bank fraud crisis was in full flower which is one of the mandates he refused to honor -- and he summarily refused. I imagine that if Sanders had won, he'd be facing an even MORE unified neoliberal fascist congress than we had in 2009. And as such, even if Sanders did CALL FOR anti-neoliberal changes, he would never get any. The ONLY answer is for left voters to abandon the democraps forever and coalesce around some as-yet undefined truly left party. I had hoped Sanders would catalyze this after the ratfucking he took from the DNC, but he went fetal instead. We'll have to find another. I could not agree with you more. And Sanders "went fetal", as you say, because he was threatened. That means the truly left party and truly green party people have to be ready to truly resist when their leader gets sabotaged, threatened, or assassinated. Just like in Latin America. The disaster capitalists are predators, but they are utterly dependent on the rest of us for their wealth. We need to gain an understanding of what is required of us to stop cooperating with their system. That is the missing piece to the only way out.